This is Day Nine in a 9 day series featuring apples. Click here to start reading at the beginning of the series. 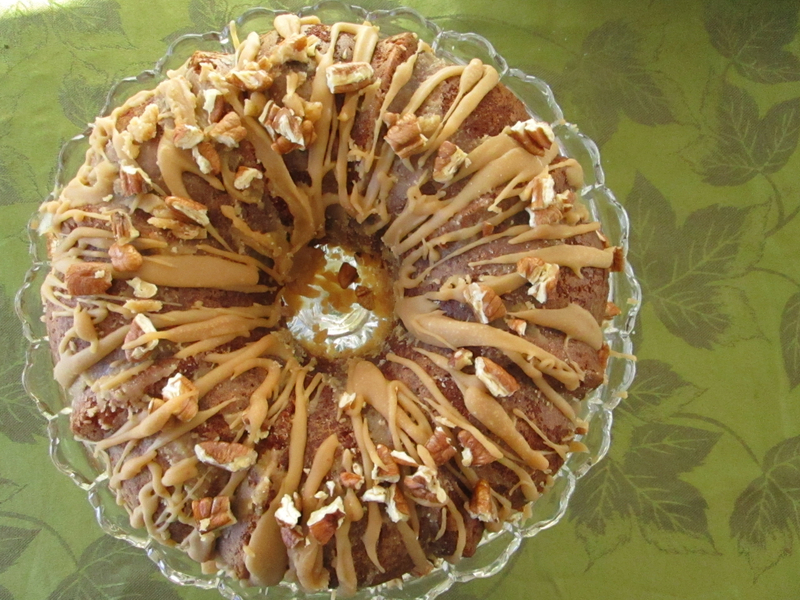 The recipe for this delicious moist apple cake, with a cream cheese center and an easy caramel topping, is one of our favorites to pull out each fall. 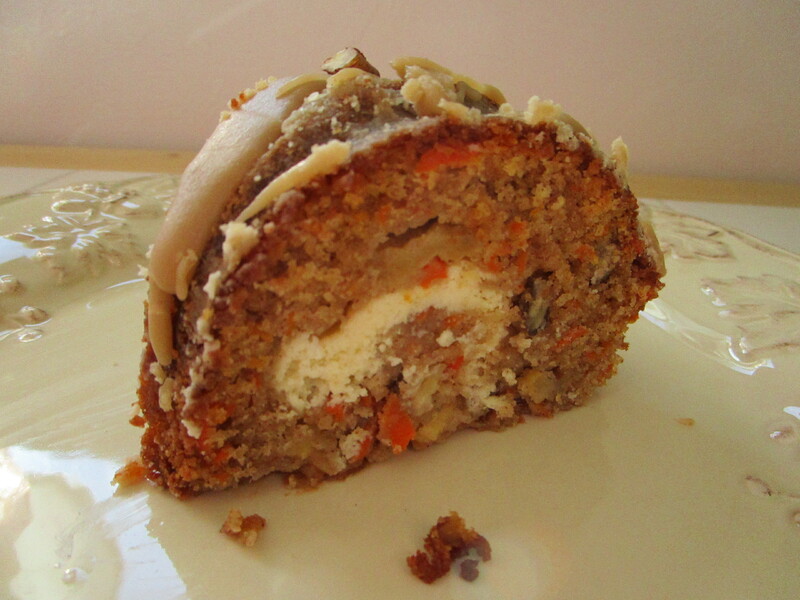 The cake itself is full of apple, shredded carrot, and pecans in every bite. All of the best autumn flavors! Several times this cake has been the birthday cake choice, and it is always a gorgeous presentation. Here are more detailed directions, with the full recipe at the end of the post. For the cheesecake ribbon, beat a brick of cream cheese until fluffy. For the cake: beat together the oil (or use half oil, half applesauce), 1 3/4 cup sugar, and 3 eggs. Beat it until it’s good an’ frothy! Add the flour mixture to the oil mixture. And beat it until it’s combined. Add the chopped apple, shredded carrots, and pecans! Grease and flour a 10-inch fluted tube pan. Time to put this cake together! Spoon most of the batter into the pan. Then scoop the cream cheese filling by little spoonfuls around the center of the cake, being careful that it doesn’t touch the pan. Spoon the rest of the batter over the cream cheese filling. Bake at 350 degrees F. for 50-60 minutes or until it tests done with a toothpick. 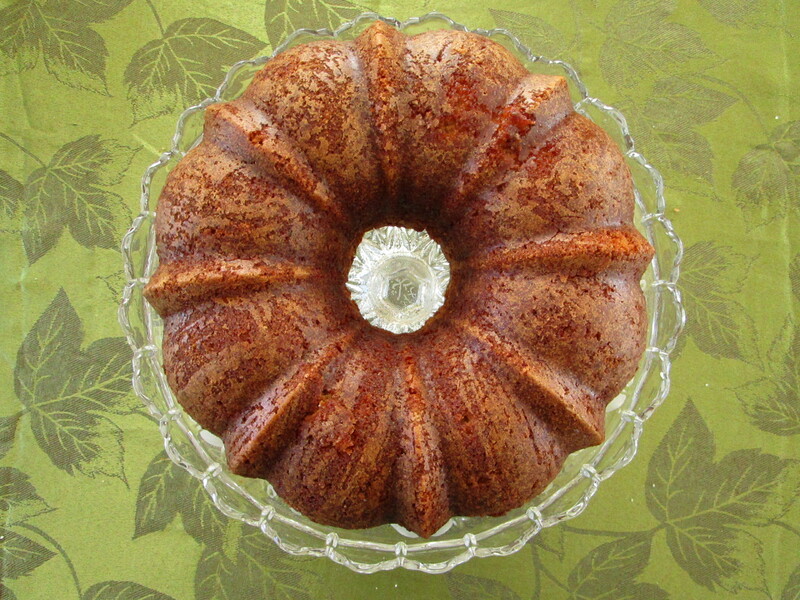 Allow the cake to cool for 10 minutes before inverting it onto a wire rack to cool completely. For the caramel icing, combine the brown sugar, butter, and milk in a saucepan. Stir it until it’s smooth. Let it come to a boil, stirring it occasionally. When it’s boiling, cook and stir it for 1 minute. Remove from heat and whisk in the powdered sugar and vanilla until the icing is smooth. Drizzle over the cake. The icing will cool and harden quickly, so be sure to work fast! Scatter pecan pieces across the icing, and press them in gently, so they stay put. For cream cheese filling, in a small bowl beat cream cheese and 1/4 cup sugar until smooth. Beat in egg; set aside. In a large bowl, beat oil, 1 3/4 cup sugar, and 3 eggs until well blended. In a separate bowl, combine the dry ingredients; gradually beat into oil mixture until blended. Stir in apples, carrots, and pecans. Transfer half of the apple batter to a greased and floured 10-in. 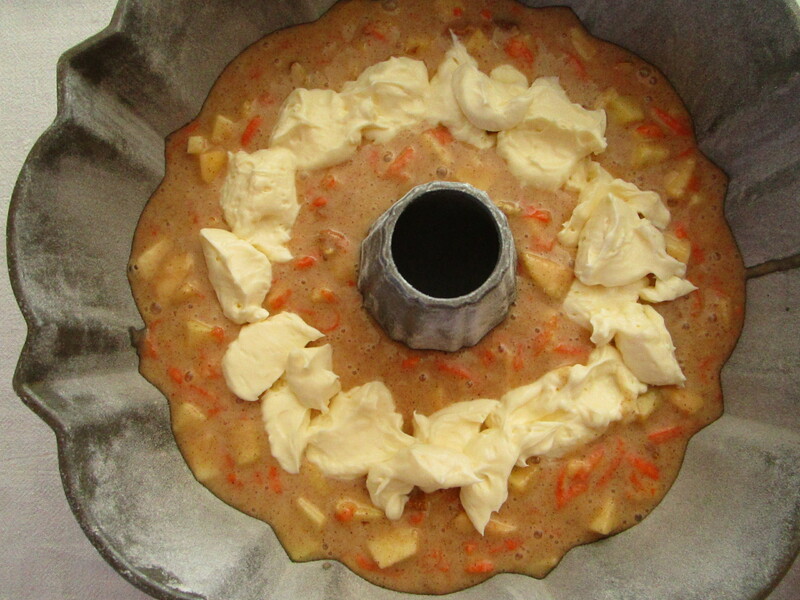 fluted tube pan; layer with cream cheese mixture and remaining apple batter. Bake at 350 degrees F. for 50-60 minutes or until cake tests done with a toothpick. Cool for 10 minutes before removing from pan to wire rack to cool completely. For the icing, in a large saucepan bring the brown sugar, butter, and milk to a boil. Cook and stir for 1 minute. Remove from heat; whisk in powdered sugar and vanilla until smooth. Drizzle over cake. (Icing will cool and harden quickly.) Sprinkle with pecans. Thank you for visiting A Homespun Country Life!